Build a party and compete for glory! 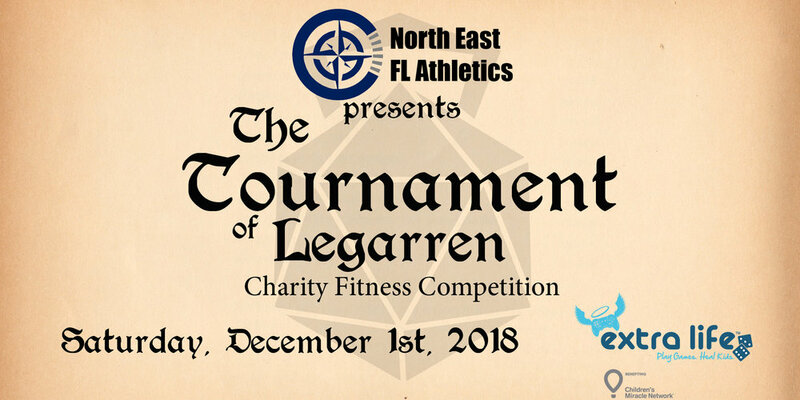 The Tournament of Legarren is a charity fitness competition that will take place on Saturday, December 1st, 2018 at North East Florida Athletics in Fleming Island, Florida. Teams of 5 will compete for the title of “Knights of Legarren”. Each team must consist of a Fighter, Barbarian, Ranger, Rogue, and Druid. Entry fees are “pay-what-you-want” with 100% of the fees going to Extra Life, a charity that benefits Children’s Miracle Network Hospitals. Fighters will complete 5 individual challenges: 2 minute maximum repetition push-ups, sit-ups, air squats, kettlebell swings with a 35 pound kettlebell, and strict pull-ups. Proper form must be used. If modifications are necessary, reps will be counted at a 2:1 ratio.